Not ready to open online? 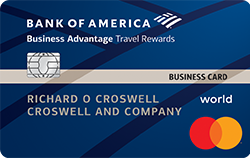 Please see Terms and Conditions for Business Advantage Travel Rewards World Mastercard credit card for rate, fee and other cost information. All terms may be subject to change. Manage your business with a suite of online services including automatic payments, transfers and downloading transactions into QuickBooks. Travel services your business needs including $1 million in travel accident insurance, lost luggage reimbursement, trip cancellation coverage, and trip delay reimbursement. Enjoy greater security and peace of mind with a credit card enhanced by chip technology – now the security standard in the U.S. Plus, chip credit cards are accepted in more than 130 countries, including Canada, Mexico and the United Kingdom. Zero liability protection for unauthorized transactions. Additional protection for misuse by terminated employees and for most purchases against loss, damage, theft, or fire. An optional service to help prevent declined purchases, returned checks or other overdrafts when you link your credit card to a Bank of America business checking account for overdraft protection. We block potential fraud if abnormal patterns are detected and let you know if we suspect fraudulent activity. Credit is subject to approval. Credit cards are issued by Bank of America, N.A. We have the right to change your terms, rates and fees at any time, for any reason, in accordance with the business card agreement and applicable law. Please see the terms and conditions. Link opens in a new window. for important information concerning this offer.